Word combination “home library” obtains a new meaning in 2014, and most people won’t think about hardcovers and paperbacks piled on the shelves in the living room but about digital library with ebooks. This is a great way to save money and get an easy access to all sorts of books. 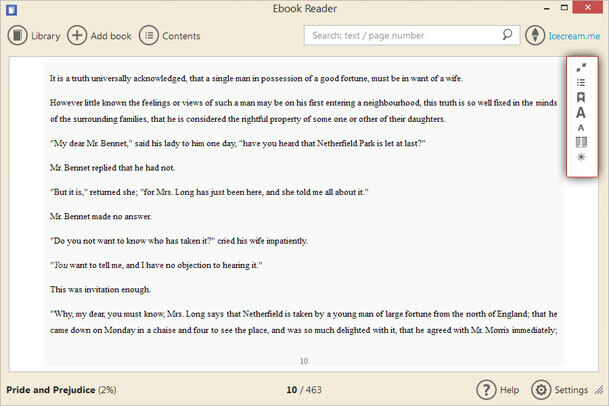 Icecream Ebook Reader is a versatile application that is compatible with all popular types of ebook formats like EPUB, FB2, PDF, and other extensions. Read on to understand how it works and learn how to organize a home library in a smart way. 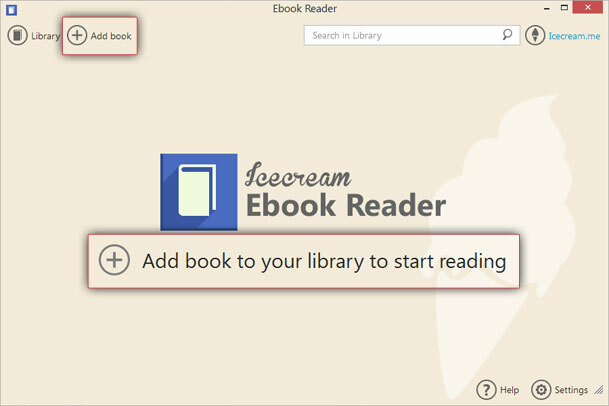 To start using Icecream Ebook Reader for organizing your digital library, download it onto your computer and save a setup file. Run it to initiate the installation and follow the Wizard’s guidelines to successfully complete the process. It’s won’t take you a long time, and after a few seconds you will be able to use the program for your needs. 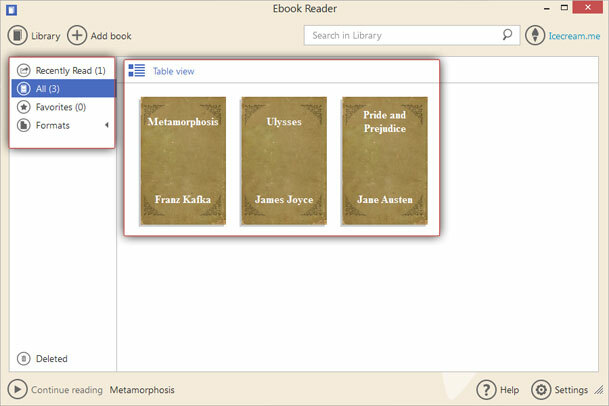 The “Add book to your library to start reading” button in the center of the main window or "Add book" button in the upper left corner will bring you to Windows Explorer – browse your computer to select the book that you want to add to your digital library. Click on the “Library” button in the upper left corner of the main window to access the books that you’ve already added. There are two comfortable modes to view your ebooks in. The Table view mode displays some important information about the file, such as book’s title, author, progress, format, and date of adding. The Book shelf mode neatly displays all the books as large thumbnails and gives you a comfortable search experience. Click on the icon in the upper left corner of a working area to choose a necessary mode. The program features a menu at the left side of the window – it allows you to check your recently read books or view the favorites (click on a star icon on the right of the book in the Table view mode to mark a book as favorite) and supported formats (EPUB, FB2, MOBI, and DJVU). To delete a book from the list, press a recycle bin icon in front of an unwanted book in the chart. Repeat the process for as many ebooks as you want and proceed with the settings. Profiles. 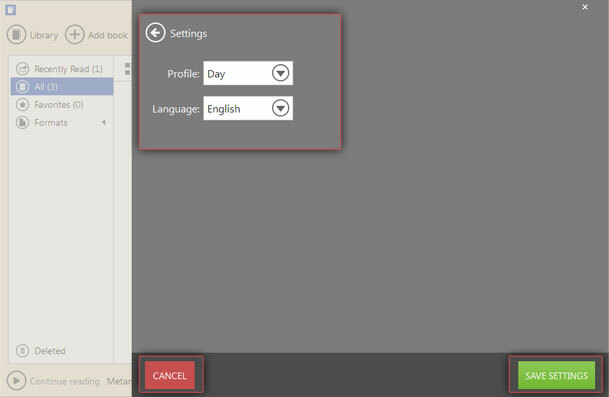 To choose a profile, click on a little arrow in the “Profile” setting and choose one that you want (Day, Night, or Sepia). Language. Click on the arrow in the “Language” setting to change the language of the interface to Spanish, Italian, Russian, German, Japanese, etc. Click on the “Save settings” button in the bottom right corner to save the changes. If you don’t want to apply the settings you’ve just configured, simply click on the “Cancel” button in the bottom left corner. Now, when you organized your home library, you can skip straight to reading. Double click on a book’s thumbnail to read the actual book on the screen of your PC. Use the “Left” and “Right” keys on the keyboard, press “Space” and “Backspace” buttons, click on the right or left side of the window, or scroll down to turn the pages. And that’s how you organize a home library with Icecream Ebook Reader!